HOLLYWOOD SPY: NBC ORDERS JULIAN FELLOWES' 'THE GILDED AGE' 19TH CENTURY NEW YORK TV SAGA! WUTHERING HEIGHTS' SEQUEL 'ILL WILL' TO BECOME TV SERIES! NBC ORDERS JULIAN FELLOWES' 'THE GILDED AGE' 19TH CENTURY NEW YORK TV SAGA! WUTHERING HEIGHTS' SEQUEL 'ILL WILL' TO BECOME TV SERIES! We mentioned this one many years ago and now it is finally and quite officially moving ahead as NBC has announced their work on new period set saga THE GILDED AGE from super popular Downton Abbey creator Julian Fellowes. The ten episode series, to air next year, is set in 1880s New York, a period of immense social upheaval, of huge fortunes made and lost, and of palaces that spanned the length of Fifth Avenue. In the series, Marian Brook is the wide eyed young scion of a conservative family who will embark on infiltrating the wealthy neighbouring family dominated by ruthless rail road tycoon George Russell, his rakish and available son Larry, and his ambitious wife Bertha, whose “new money” is a barrier to acceptance by the Astor and Vanderbilt set. Marian is about to experience a whole new world springing up right outside her front door. The project was first announced five years ago. Speaking of period set classics, Wuthering Heights is getting a sequel in the form of a TV series! 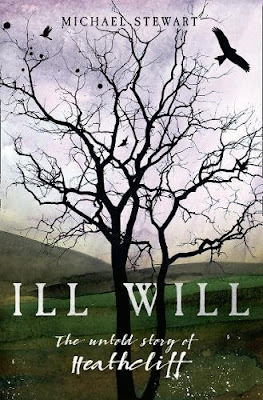 ILL WILL from Michael Stewart will be turned in an epic neo Gothic series which offers up the missing piece of the puzzle about Wuthering Heights‘ tortured hero: Where does Heathcliff, the ‘uncouth stable boy,’ go when he disappears from the moors halfway through the story? And what happened to him that he should return three years later a stupendously wealthy and educated man, primed to take revenge upon the Earnshaw family? As 'Deadline' reports, the series will explore the new narrative in combination with Brontë’s 1847 novel answering the question of what happened to Heathcliff, her enigmatic anti-hero. It will be done by Kudos, producers of Broadchurch and BBC's Troy Fall of a City. The Gilded Age sounds like a must see for me. That time period is so fascinating to me. Speaking of sequels, I just heard today that they are doing a sequel to Passion of the Christ. I had to roll my eyes at that one. Didn't Mel Gibson make like a billion dollars on the first one? How much further can you expand on after Jesus was nailed to the cross? I can't wait for all of the religious nuts to start jumping for joy when it is released. I'm guessing it will be opulent given it is Fellowes. Yes, and they said it will be the biggest movie ever. All those Biblical movies make me fall asleep. Passion was difficult to watch and after Apocalypto I consider Mel a crazy man. Mary Magdalene movie is coming out soon too with Roonie Mara. The trailer was so dreadful I did not even consider publishing it. I agree. Passion was a snooze fest for me. Jason's never been to church so he had no idea what was going on through the whole thing hahahaha! I'm sure the sequel will do well. People love to throw their money at religion. That Heathcliff series sounds great! He's such a compelling anti-hero. Oh, The Gilded Age sounds like a good one!